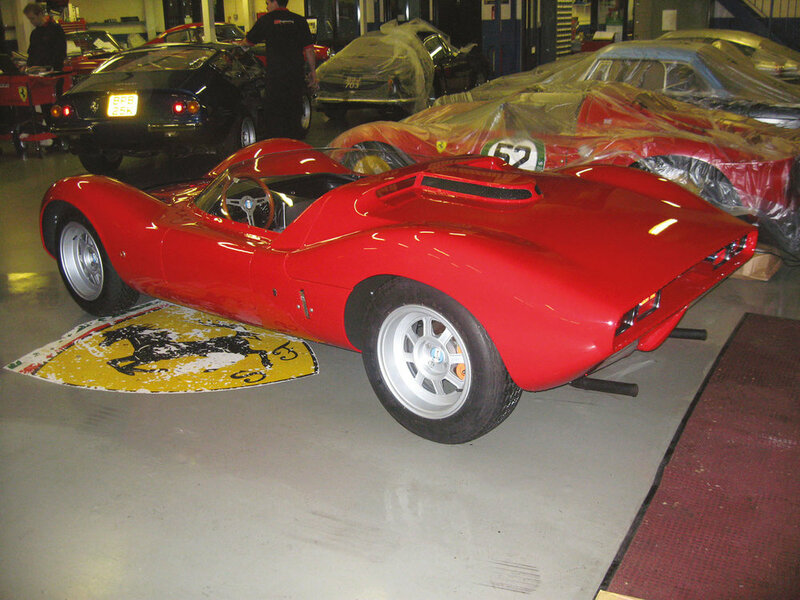 When De Tomaso left OSCA and the Maserati brothers to start building his own race cars; OSCA remained a key engine supplier to De Tomaso and a number of prototypes ensued, including the Sports 1000, 1500 and 2000. Around this time, De Tomaso was developing his new 'spine' chassis, formed by a central backbone; and in the Sports 2000 the chassis was made of titanium with the frame also serving as a fuel tank carrying 120 litres. The engine used was an all alloy flat eight cylinder Massiminio design (capacity 1931 cc,) forming a part of the load bearing chassis, with rear suspension parts directly fitted to it. Designed by Giorgetto Giugiaro, the Sport 2000 was a small car, with a body resembling that of the Vallelunga spider. With an optimal power/weight ratio, the car could reach a speed of 256 km/h. This 1963 prototype had great potential, however, with limited development budgets, the Sports 2000 never went into production. In 1964, De Tomaso had hopes of entering a prototype sports car into US and European races. Old racing friend and vehicle designer Carroll Shelby was himself looking for a replacement chassis for his 'King Cobras.' Using some of the funding already secured by Shelby from Ford for the Cobra programme, they had an idea to collaborate on a mid-engined open sports car project, with a view to going into production to sell to privateer racers. Initially known as the 'P70,' or '70P,' the Sport 5000 used a scaled-up, stainless steel version of the spine chassis employed for the Sport 2000 and Vallelunga upon which the 5-litre (4,736 cc) Ford V8 was mounted. Designed by Peter Brock, with fabrication by Medardo Fantuzzi, this prototype employed a ZF five-speed gearbox, a concave rear tail profile for aerodynamics and an inventive 'ring aerofoil' with movable centre section, allowing the driver to adjust the level of downforce on the rear wheels. The vehicle was displayed at the Turin Motor Show in 1965, renamed the 'Ghia-De Tomaso Sport 5000' as by this time, Shelby had himself withdrawn from the project to work on Ford's own race programmes and consequently the project was now funded by Ghia. The prototype, with its striking red bodywork received a lot of attention, providing further impetus to continue development. 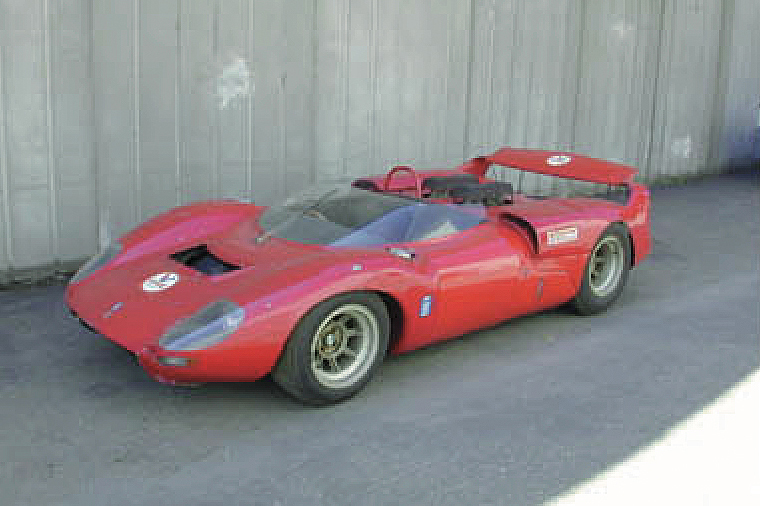 Prior to its racing debut, De Tomaso modified the design further and built a second car to be used under the Sport 5000 name. The car was entered and raced by Roberto Bussinello in Round 8 of the 1966 World Sportscar Championship, but retired on the opening lap. The Sport 5000 was never raced again. The second of the two prototypes, the Competizione 2000, although starting in development before the P70, did not appear at the Turin Motor Show until 1966. The designer attributed to this alternative prototype was Giugiaro and there were a number of significant design differences to the 5-litre car. Its engine air intakes were on the sides of roll bar structure (the 5-litre had scoops in the rear flank.) The front radiator had a low air intake with two exhaust vents on the front lid. The vehicle-wide exhaust vent incorporated four rectangular barrels of which the outer ones housed the taillights and the inner ones, the exhaust pipes and there is a notable absence of an aerofoil. This prototype was said to use a mid-mounted 2-litre flat-8 engine, an 'All De Tomaso' car, although there is speculation that this was for marketing purposes. Even so, De Tomaso was producing prototype all-alloy engines in all types of configuration. De Tomaso Sport 5000 with an aluminium custom engine and Hewland five-speed gearbox.